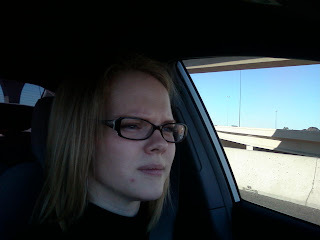 Mom, the Intern: My rush hour face. Notice the furrowed brow, the clenched jaw. The huge zit on my face. STREEESSSSSSSSSS. Driving has never been particularly fun for me. If I had my way I'd ride the light rail, fly, or teleport. But seriously, the 60-mile roundtrip drive is starting to catch up to me, as evidenced by this picture. Pollyanna moment: At least the skies are blue and the roads are snow-free! If this picture were taken in Utah, I'd probably have flames in my eyes and that zit would be a planet. 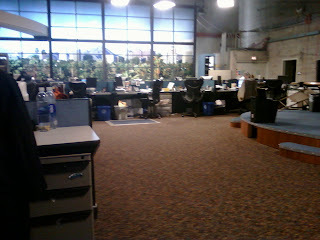 Off to the right, you see the temporary set they used while building the new one. In the middle there are lots of computers. That's where the reporters write. Behind that is the "window". It's actually a backlit mural of downtown Phoenix that looks like a window. There aren't any real windows, so they came up with this. It sure tricks you when it's raining outside, though. That back corner with the little light over the door? That's how you get to the bathroom and the water fountain. I like that door. Next time, I'll post a picture of the Giant Wall of Monitors and the ENG. It will remind you of NASA. I'm trying desperately to keep up with housework but I think I'm failing. I still sweep and put dishes in the sink but that's about it. I try to cook dinner on my off days, but it's usually bean burritos or grilled cheese. Audrey seems to be coping fine with it all; I think she likes the "Grandma Time" she's getting twice a week. I do miss her during the days. I've realized I have to go to bed at 9:30 if I want to be somewhat coherent the next morning. I can't remember the last time I went to bed that early. Third grade? Basically, a long time ago. I've also developed extreme sleep anxiety. Anyone who has ever shared a room with me can attest that when I get stressed, I sleep-talk. And walk. The other night, I had a vivid dream I was driving on the freeway. It was night time and traffic was horrendous; the freeway was a sea of red lights. In my half-awake stage, I looked at my alarm clock and read 2:06. I tapped Dillon on the shoulder and said, "Honey, why is traffic so BAD at 2 in the morning?" When I realized what I was doing (how embarrassing! ), I rolled over and went to sleep. Amusing, yes. But I do wish these dreams could be limited to the confines of my brain.